Aerial 360 videos are beautiful to watch but they create several challenges. One of them is finding a way to attach a 360 camera to the drone. Second, you’ll need to find a way to avoid having the landing skids appear too prominently in the video. Third, if you address the second issue by suspending the 360 camera far below the drone, you’ll need to find a way to keep the horizon as level as possible for viewer comfort. Fourth, you’ll need to deal with the drone being in the shot. 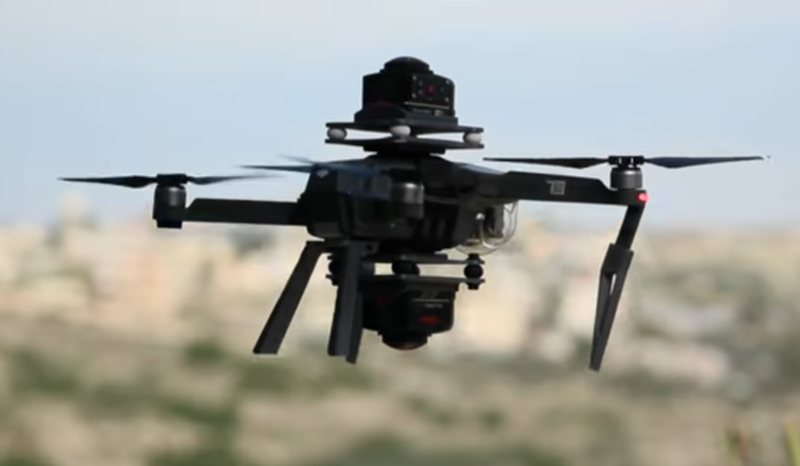 These issues are in addition to dealing with your drone’s performance limits. One possibility is to suspend a 360 camera (or a 360 rig) below the drone using a stabilized 3-axis gimbal. 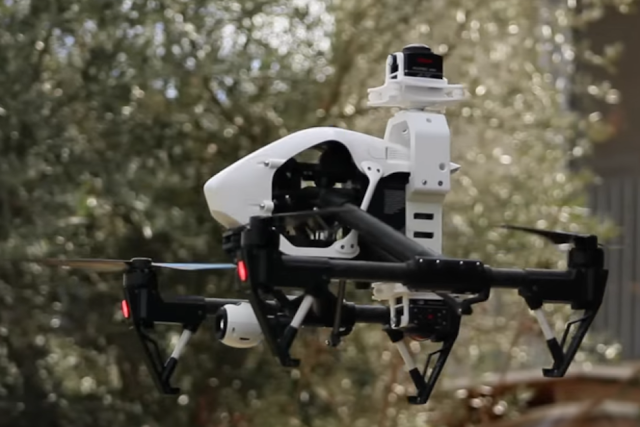 Aerial gimbals for this purpose are usually not cheap, such as the NS VR gimbal, Wenpod Tarzan-A, or the TG20 stabilized rig that each cost around $2,000. They also tend to be heavy, requiring larger and more expensive drones. Finally, you would still need to remove the drone from the shot in postprocessing. Another possibility is to attach a 360 rig around the drone. That’s the approach taken by Kodak with the Aerial Kit for the Kodak SP360 4k Dual Pro, which allows you to mount one SP360 4k on top, and another below, a 3DR Solo drone. This approach addresses all four issues – most importantly, hiding the drone from the shot. However, with the SP360 attached to the 3DR Solo, you won’t be able to see what the drone sees. Many users don’t want to fly blind or simply want to use the SP360 4k Dual Pro with a newer or more powerful drone. Gimbal-Guard has the answer. Kodak SP360 4k Dual Pro mounted on DJI Mavic Pro with Gimbal-Guard. Image by Gimbal-Guard. Gimbal-Guard is a company that makes protective covers for gimbals on various popular drones. 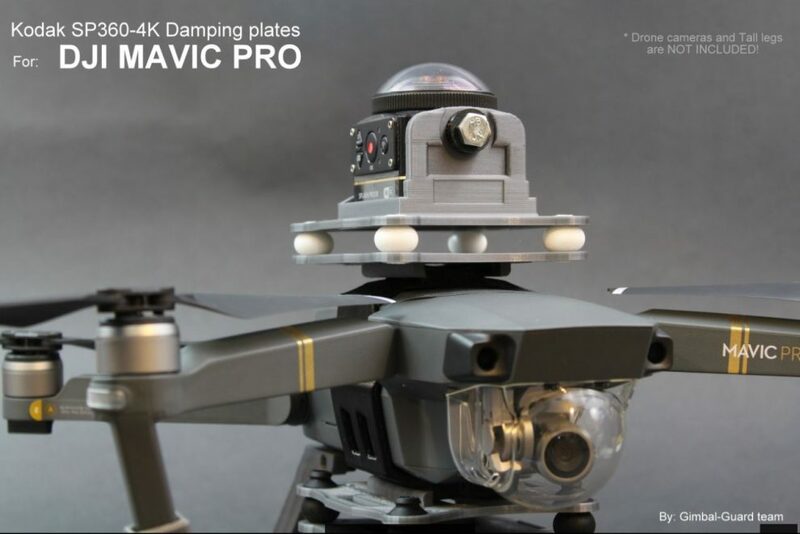 They have also made brackets that enable you to attach the SP360 4k to a DJI Mavic Pro, or a DJI Inspire-1, similar to the way Kodak’s Aerial Pack enables you to mount the SP360 4k Dual Pro on the 3DR Solo. The critical difference is that you can continue to use the drone’s own camera. SP360 Dual Pro mounted on Inspire-1 with Gimbal-Guard. Image by Gimbal-Guard. Please note Kevin is using extension legs in this test, and you can see the legs in the video. Gimbal-Guard recommends not using extension legs for best results. Since the legs will be too short to keep the lens from touching / hitting the ground, you’ll need to hand catch it, which is actually easier than it sounds. The trick to hand-catching a drone is that you’re not literally catching the drone as it descends. Rather, you allow the drone to hover above eye level and then you carefully approach the drone, and grasp one of legs firmly. While holding on to the legs and with the drone hovering, you then power down with the other hand. Launching a drone by hand is tougher than hand catching it. The hard part is that you have to hold the drone level as it powers up. But with practice, you can do it. Alternatively, you can place the drone between two supports that are tall enough to keep the lens off the ground. 1. Kodak Aerial Pack (includes the SP360 4k Dual Pro plus the aerial bracket). This kit used to cost less than purchasing the SP360 4k and the bracket separately but these days the SP360 4k is on discount while the Aerial Pack is not, so it may cost less to purchase separately (see links below). 3. Kodak bracket by itself (if you already have the Dual Pro or if you want to purchase separately). 4. 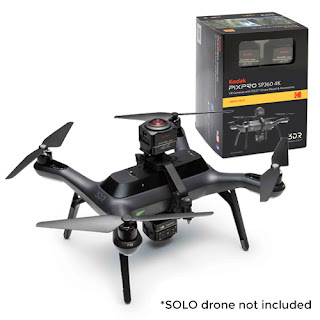 3DR Solo – note: you won’t need the GoPro gimbal but you may want it for non-360 videos. Do you have ideas of how you would use aerial 360 videos, such as for weddings or for that once-in-a-lifetime trip? Share your thoughts in the comments! Thank you very much to Jorge Arrieta for bringing this to my attention!